Trinetra Wireless, a leading Telematics solutions provider is pleased to announce its participation in Commercial Vehicles Middle East (CVME) exhibition, the region’s only event dedicated to commercial vehicles, parts and services in which all commercial vehicles’ importers and their customers from the Middle East & GCC regions will gather under one roof, planned to be held in Sheikh Saeed Halls 2 & 3 at Dubai International Convention & Exhibition Centre from 06th to 08th March 2012. For 3 days the event is being organized by Streamline Marketing Group. At Trinetra, we value every opportunity to meet with our clients and partners and look forward to everyone’s presence at Booth No. A6. After receiving excellent response in the last year CVME 2011 Trade Show from Middle-Eastern audience, Trinetra is all set to participate again in this year’s show. Trinetra’s pavilion this year will be showcasing its holistic, award-winning, eco-friendly Fleet Management System and solution offerings as well as a live demonstration of the product. At Trinetra, we are always keen to keep up with the latest development in the fleet management industry, in addition to promoting our brand presence and experience in this vital and vibrant domain. Trinetra’s primary objective of participating in CVME 2012 and other prestigious events across the globe is to gain market insights, obtain useful feedback that help us shapeup our product roadmap, acquire exclusive technology sales leads from qualified prospects, and also to better understand the customer’s needs. Every year we look forward to attending this region’s only specialized event. It gives us the opportunity to establish new customer contacts while enhancing our existing customer relationships. It also gives us the chance to connect with the target audience and provide them with first hand – real – live – information regarding the products and solutions we offer. If you’re looking to innovate or source the right fleet management solution to transform and streamline your business then make sure you register online today and get free tickets to meet us between March 06 – 08, 2012 at Commercial Vehicles Middle East Expo.Don’t miss this opportunity to establish a long-term business relationship with Trinetra. Visit us at our Booth No. A6 and you’ll have access to our stall representatives and team of experts who are working round the clock to make the things happen for them and will be ready to demonstrate our Fleet Management System. We will also be ready to answer any questions you may have on the broad range of solutions for your GPS vehicle tracking needs. If you’re in the area, stop by and be sure to enter our booth. We’re located at exhibit booth #A6. We hope to see you at the show. 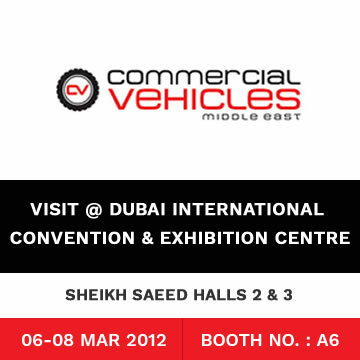 To schedule a meeting with Trinetra Wireless at Commercial Vehicles 2012 Middle East, Contact us here. Want to know more about Trinetra? You can request for a product demo here or request an appointment here. Trinetra Wireless is participating in the international trade fair Intersec, at Dubai.